International Paganini Competition awarded Italian violinist Giuliano Carmignola performs Vivaldi’s string concertos at the Enescu Festival. 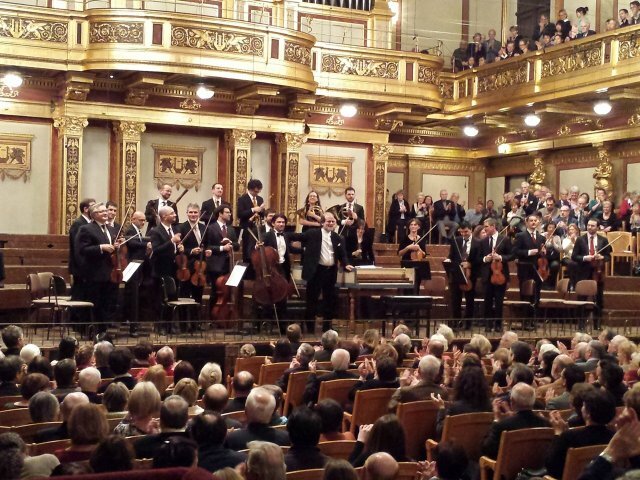 Accompanied by the Venice Baroque Orchestra also conducted by himself. An amazing performance, enjoy. Italian violinist Giuliano Carmignola was born in Treviso in 1951. He studied with his father, then with Luigi Ferro at the Venice Conservatory and afterwards with Nathan Milstein and Franco Gulli at the Accademia Chigiana in Siena, Italy and Henryk Szeryng at the Geneva Conservatory. In 1973, he was awarded a prize in the International Paganini Competition in Genoa. He began his career as a soloist under the direction of conductors such as Claudio Abbado, Eliahu Inbal, Peter Maag and Giuseppe Sinopoli, performing in prestigious concert halls. He then collaborated with Umberto Benedetti Michelangeli, Daniele Gatti, Andrea Marcon, Christopher Hogwood, Trevor Pinnock, Frans Brüggen, Paul McCreesh, Giovanni Antonini and Ottavio Dantone. Significant was his collaboration with the Virtuosi of Rome during the ‘70s and later with the Sonatori della gioiosa Marca, the Venice Baroque Orchestra, the Mozart Orchestra, the Orchestre des Champs Elysees, the Kammerorchester Basel, Il Giardino Armonico, the Zurich Chamber Orchestra and the Academy of Ancient Music. Founded in 1997 by Baroque scholar and harpsichordist Andrea Marcon, the Venice Baroque Orchestra is recognized as one of the premier ensembles devoted to period instrument performance. The Orchestra receives wide critical acclaim for its concert and opera performances throughout North America, Europe, South America, Japan and Korea,Taiwan and China. The Orchestra has appeared in many more cities across the United States than any other Baroque orchestra in history. They also maintain the most frequent touring schedule to Asia.